Bitrix24 Gold partner MAKE Interactive has released a new free app that allows you to convert .docx files to PDF quotes. See CRM PDF. This app allows the creation of PDFs from Quotes in the Bitrix24 CRM using templates that can be built by the user. 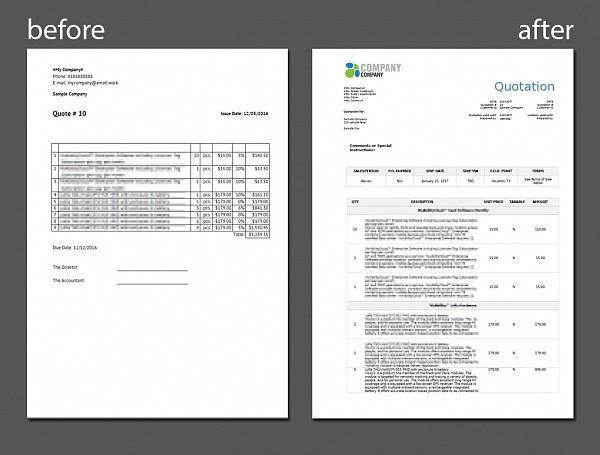 Templates are in .docx format and can be stored in a folder in any Bitrix24 Drive. Templates support variables from Quote fields as well as images, headers, and footers. Quotes made with the app can also include additional columns in the product table, such as product description, discount description, etc. The app does not yet support invoices but does support custom fields created in Quotes.